Arjan Oude Kotte (konajra) is one of those rare builders who only seem to build and post brilliant stuff and we have blogged most of it. 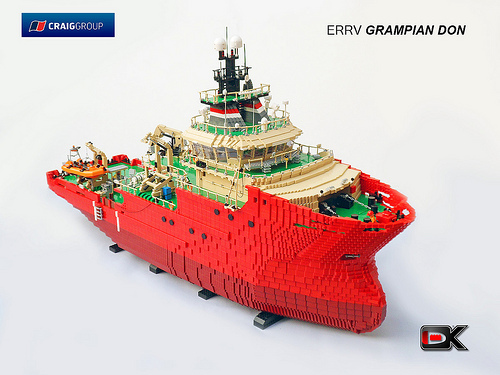 His latest masterpiece is a minifig scale model (1/40) of an offshore support vessel, the ERRV Grampian Don, which is operated by the Craig Group based in Aberdeen, Scotland. An ERRV is an Emergency Response Rescue Vessel, which is a type of ship that constantly patrols a zone around offshore installations, to ensure that other ships don’t stray into the zone, thereby preventing collisions, and in case of an emergency, to rescue platform crews and coordinate the response. Arjan started designing this model in November last year. It’s a proper SHIP, with a length of 125 cm (more than 4 ft) a height of 74 cm (more than 2 ft) and a width of 32 cm (about 1 ft). His ships seem to be getting more and more complicated. The wonderfully sculpted bulbous bow is a novelty and check out the angles on the bridge windows.